If you’ve followed the Kansas high school football playoffs, you’ve no doubt seen the scores. Eight-man football, right? No? 6-man? Needless to say, Wichita Northwest has endured and survived some high-scoring contests in the past couple of weeks. The Grizzlies outlasted defending 5A champion Bishop Carroll, 84-67, in the quarterfinals before scoring in the final 30 seconds to top Maize 67-60 in last week’s semifinal. All of that scoring, all of those points, all of that drama has led Northwest to the schools’ first state title game appearance since 1996. “It’s great! It’s good for our school and our community here on the west side,” seventh-year Grizzly coach Steve Martin said. “It’s been a fun journey this year”. Wichita Northwest (12-0) will take on St. Thomas Aquinas (11-0) in the Class 5A state championship game at Pittsburg State’s Carnie Smith Stadium on Saturday. Kickoff is set for 1:00 p.m. The Grizzlies and Saints are each trying to capture the first state football championship in school history. Wichita Northwest seemingly challenges the state record for total offensive production each season under Martin, who is 56-19 at the school. This season, the Grizzlies average 596 yards per game in total offense, including nearly 410 yards rushing per contest. 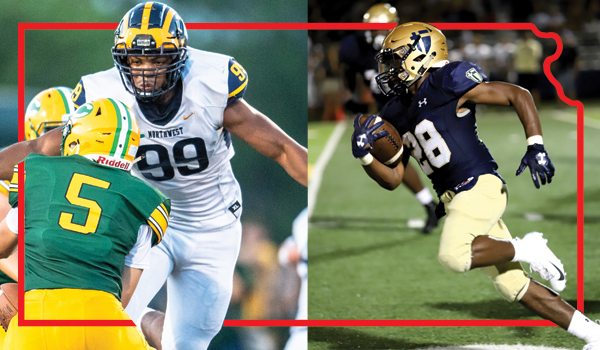 Northwest features three players who have rushed for more than 1,000 yards, including a 2,000-yard rusher in senior running back Breece Hall. Hall, an Iowa State commit, has rushed for 2,099 yards and 28 touchdowns this season. In Northwest’s three playoff wins, Hall is averaging more than 250 rushing yards per game. He’s joined in the backfield by senior Roy Johnson (1,168 rushing yards, 15 TDs) and junior quarterback Reagan Jones (1,376 rushing yards, 20 TDs). But despite the star-power in the backfield, it’s easy for Coach Martin to identify the key to the Grizzlies offensive success. Northwest’s offensive fire-power certainly hasn’t gone unnoticed by veteran Aquinas coach Randy Dreiling. Jones, who started at quarterback at Andover Central as a sophomore last season before transferring to Northwest, has provided balance to the Grizzly offense by passing for 2,236 yards and 31 touchdowns against only four interceptions. Zion Jones leads the Northwest receiving group with 29 catches for 574 yards and 10 touchdowns. It was Zion Jones who caught the winning touchdown pass from Regan Jones in last week’s semifinal win over Maize. The Grizzlies trailed 60-59 at the time after leading by 19 points heading into the fourth quarter. While Northwest is making its first title game appearance in 22 years, Aquinas is back in the 5A title game for the third time since Dreiling took over the program in 2014. The Saints lost to Bishop Carroll, 38-28, in last year’s championship, also in Pittsburg. This year’s Aquinas team is loaded, and many believe it is the best team Dreiling has had. That a strong statement considering Dreiling won seven state championships at Hutchinson. The Saints average 46 points per game while giving up only 13 points per contest. Similar to Northwest, Aquinas likes to get things done on the ground. The Saints’ flexbone rushing attack as produced 387 yards per game behind a dominant offensive line that includes Oklahoma State commit Joe Michalski (6-5, 280) and sophomore giant Jaeden Roberts (6-6, 320). Another sophomore has been a breakout star for Aquinas this season. Running back Tyron “Tank” Young has exploded onto the scene to rush for 1,743 yards and 22 touchdowns in only nine games. Senior Cameron Jackson, an all-state selection in 2017 after rushing for more than 1,400 yards, has rushed for 617 yards and six scores this fall. Quarterback Tate Raboin has been steady in his first year as a starter after learning from two-year starter Will Swanson. Raboin has passed for 874 yards and 12 touchdowns on the season. Martin expects the Aquinas offense to come right at Northwest, something the Grizzlies haven’t seen in a while. Northwest will counter on the defensive side of the ball with Oklahoma commit, Marcus Hicks and linebacker Josh Carter. Hicks, a 6-foot-6, 245-pound defensive end, has 77 tackles, including 25 for loss and seven sacks. Carter, one of the pound-for-pound strongest players in Kansas, leads the team with 122 stops, including 15 for loss. Martin praised the two senior leaders of his defense. But the matchup that most will key on is the high-scoring Northwest offense against the Aquinas defense. While Northwest averages 410 yards per game rushing, Aquinas has limited opponents to less than 93 yards per game on the ground. Zach Goodeyon leads the Saints with 69 tackles, while fellow linebacker Bo Meisenheimer and safety Max Seibolt have contributed 52.5 and 51.5 stops, respectively. The Saint defensive line is led by returning all-state selection and North Dakota State commit Javier Derritt who has 33 quarterback hurries and 11 tackles for loss. Meanwhile, senior Jayden Russell is a defensive back that will also play a high-level of college football in the near future. Dreiling believes his Saints understand the challenge ahead of them. While all the highly-recruited players on the field will help with the hype and ticket sales, Dreiling believes the other players will help decide which team captures their first state title on Saturday.